Ma Ailun, the 23-year-old Chinese woman who was killed via electric shock when answering a call on her iPhone last week, was most likely using an unauthorized third party charger, reports the South China Morning Post. Knockoff chargers often use low cost supplies and fail to meet standards for the adequate isolation of electrical input and output, making them more dangerous than brand name chargers that are subject to safety regulations. The alleged phone and charger that were in use during the incident. According to Xiang Ligang, a telecommunications expert interviewed by CCTV, the charger Ma had been using may have been a "knockoff" - a fake. "Knockoff chargers sometimes cut corners," Xiang said. "The quality of the capacitor and circuit protector may not be good, and this may lead to the capacitor breaking down and sending 220 volts of electricity directly into the cell phone battery." The woman was also reportedly using an iPhone 4 at the time of the incident, rather than an iPhone 5 as was originally stated. The iPhone 4 contains stainless steel, while the iPhone 5 is primarily aluminum. It is still unclear what caused the malfunction, as the iPhone 4 apparently remained functional after the incident. Xiang said that normally, the electric current from an overloaded charger would overheat the phone’s casing, damaging the circuits inside and rendering the device unusable. In the case of Ma’s iPhone 4, however, authorities said the phone could still be started normally despite severe traces of burning on its exterior. The phone’s data cable, charger, and plug were all intact. A police investigation into the incident is underway, and Apple has pledged to look into the accident. "We are deeply saddened to learn of this tragic incident," said an Apple spokeswoman. "We will fully investigate and co-operate with the authorities in this matter." 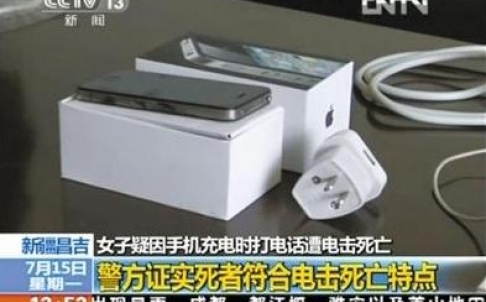 A second iPhone related electrocution has also been reported (via ZDNet), involving a man who was injured while connecting his iPhone 4 to a third party charger 10 days ago. The man, who is currently in a hospital in Beijing, remains in a coma. People use knock off cables and news outlet blow the stories out of proportions and blame it on Apple, just to get attention. In extremely bad taste... Also iphone 4 doesn't use the lightning cable so you fail. Yeah, how dare he make fun of chargers! Doesn't he realize that chargers have feelings?! Good thing it wasn't an American, then the senate would demand to interrogate Tim Cook in another hearing while whining about how rich Apple is. Lots of people called it right, but the trolls said otherwise. now do you see why Apple created the lightning cable? The Original Article repeatedly stated she used the Official Apple Charger. Not Trolling. Sorry I don't share your sympathy. A woman died from using a malecowdookie charger. Not my problem. 100 people died in the US today from car accidents. I won't stop driving tomorrow. I pity you. The fact that people die everyday, especially in accidents, shouldn't be taken so lightly. I wonder if you'd change your perspective if the situation were more personal. Now about the faulty chargers, could the two incidents be related? by definition, electrocution is always fatal...so he either wasn't electrocuted, or he is dead. Are you trying to tell me someone in China was using a knockoff cable? That is preposterous.